It was on Aug. 23, 2013, that I was removed out of my Ad-Seg cell around 5 in the morning and placed on a CDCr transportation bus. I had been housed in Ad-Seg since Aug. 5 due to my participation in a mass hunger strike. I was stripped of all my belongings except my shoes, socks, T-shirt and boxer shorts and given a dark blue jumpsuit, in which I could not fit, so I was allowed to wrap the arms around my waist. If you have to spend a vacation in prison, this looks a lot more inviting than Pelican Bay. Our mass hunger strike started on July 8, 2013, and we were 47 days without eating at the time we were placed on the bus. I heard several prisoners ask, “Where are we going?” The response from the transportation officer was “New Folsom, CSP-Sac” (California State Prison Sacramento). We pulled out of PBSP Ad Seg around 8 a.m., and it was a grueling ride due to our conditions. I was in a dual situation, where I was able to enjoy sights that I hadn’t seen in years, yet I was very conscious of the pain and suffering that we all were enduring. It was one of the most physical challenges that I had ever experienced in my life. I considered myself to be very strong, yet here I was dealing with my obvious physical weakness and my mental strength, which was creating a contradiction in which my physical weakness had begun to attack my mental strength. It was obvious to me that I would lose this battle eventually, because time would dictate my fate and I was running out of time. Once off the bus, it seemed surreal, because there were people everywhere, something unusual for me, especially since I had been held in a solitary confinement cell for the last 13 years, isolated from people and normal outside environments. My reality of the last 13 years is concrete and steel and that’s it; no normal human relations for me. This created a contradiction in which I would be overwhelmed. CSP-Sac was wide open. People were everywhere, 24/7, doing everything. I saw New Afrikans, which is something I hadn’t seen in years. I saw countless Mexicans, Asians and Afrikans off the continent. I saw regular behaving white people. I saw every nationality under the sun in one day’s time. Roscoe was a golden retriever three times my size and very strong. He was a real happy, energized dog, but when I got back there with him, his excitement was unmeasurable. I couldn’t get the chain loose to free him because he kept knocking me down in pure joy that I was back there with him. Roscoe knew that I wasn’t there to feed him or to briefly play with him and leave. He knew every time I came back there, he would be free. This is what drove his excitement, freedom. On hunger strike after 49 days by then, I was extremely excited. I felt just like Roscoe. It was literally overwhelming. I took full advantage of every human being I came in contact with, except those green suits! They were psychs, RNs, assistants to RNs, countless LVNs. It was crazy different people every day, in their regular clothes – no uniforms – every single day. I talked to the Imam, a Muslim chaplain, who was allowed in the solitary unit at his will. I talked to Christian chaplains, who were allowed to visit the solitary units at their will, too. I talked to maintenance – free persons who worked inside the prison. I talked more in a period of 12 days than I had in my whole 13 years of solitary confinement. I was taken to legal visits across the yard. I saw countless prisoners moving about freely. The sun was beaming down on me, with no blockers – just me and the atmosphere – although I had waist chains on in which I was made to walk to the attorney visit, which was a half a mile away from B Facility to A Facility. Under any other circumstances this would be exactly what it was, torture, but I was so overwhelmed, my mind was absorbing it all rapidly. I saw so much in such a short period of time, after being isolated and confined in solitary for 13 years in PBSP. This was my freedom. It started to have an adverse effect on me personally, because if the 20 representatives had not suspended our mass hunger strike … I, for sure, would have been dead, because this was one vacation that I, under no circumstances, would ever have ended. Our resolve remains as strong as ever, and we continue to press forward despite our torture being taken up a notch. We send a clenched fist salute to everyone who has been supportive of our on-going struggle to be liberated from these man-made gulags called Security Housing Units (SHUs) and Administrative Segregation Units (ASU). The 30,000 prisoners who spoke out against the dismal reality in which prisoners are being held should be a clear message to CDCr [California Department of Corrections and rehabilitation – prisoners often write the “R” in lower case because rehabilitation is denied them] officials that the dire, desperate conditions that we continue to endure are unacceptable! No one should receive a sentence from a court and then have those responsible for carrying out that sentence exact revenge and arbitrary punishments at their whim. This is the reality that 30,000 men and women lent their collective voice to opposing. The “crying gang” game is all cried out. It’s time to treat human beings like humans. A third of the prison population has clearly said that the inhumane conditions of long term solitary confinement and prison oppression must end. The exploitation of prisoners must end. The exploitation of California taxpayers must end. There is no justifiable reason why a man or woman imprisoned in the 1960s or 1970s or even 1980s should still be languishing in prison. We stand in solidarity, continuing to press forward with our protracted struggle to end these inhumane conditions. Within Pelican Bay SHU, within our struggle to shed light on the inhumanities of prison conditions and state sanctioned acts of aggression and torture, we would like to extend our prayers and thanks to the 16 hunger strike representatives who were kidnapped from Pelican Bay State Prison (PBSP) Short Corridor on July 11, 2013, and unjustly placed on “hell row” in the Ad Seg torture chambers. New Afrikan Abdul Olugbala Shakur was unceremoniously kidnapped from the Short Corridor as well, on July 24, 2013, and subjected to the same atrocities. We stand with you. With the addition of Abdul Shakur, one should take notice that he is not a rep, but instead is a critical New Afrikan thinker, who is a strong adherent to New Afrikan politics and an accomplished jailhouse lawyer. He has five pending lawsuits against the state tools of repression, CDCr and PBSP, for the injustices and inhumane conditions and treatment in blatant disregard of prisoners’ First Amendment rights that are continuously inflicted upon kaptives. It’s a clear fact that Abdul was targeted by prison officials for removal and containment with the 16 reps in order to subject him to the pain and suffering handed down to all our reps, for his and their unwavering stances against prison injustice. and Institutional Gang Investigator (IGI) Lt. J. Frisk. These acts against Abdul and the reps were purely retaliatory by CDCr officials, who utilized a peaceful protest as a pretext to justify subjecting each and every one of us to a more intense and discriminatory torture. We will not be broken by vicious systematic attacks carried out by the CDCr hierarchy. 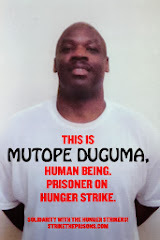 In my 29 years of incarceration, I had never seen what I would witness on Sept. 24, 2013, on our way back to Pelican Bay State Prison’s solitary confinement torture chambers after our temporary transfer during the hunger strike. We must commend our 20 prisoner representatives for having the foresight to see that the CDCr officials would be utilizing their authority – their power – to create situations and circumstances that would attempt to encourage and manipulate warfare between races inside the prison environment. On the way to CSP-Sac (New Folsom prison), on Aug. 23, 2013, for our emergency medical transfer from PBSP Ad-Seg, we prisoners were placed on the bus and separated by race. New Afrikans were placed in the up front cages. The whites were placed across from the New Afrikans in the wider cage, but still up front. The larger group of Mexicans from the Los Angeles County area was placed in the back of the bus, and they too were cut off from each other by a dividing cage door. The bus had cameras in the back and the front of the bus, so the transportation officer who’s not driving could keep us under surveillance. This was their legitimate security protocol for transferring so-called highly secured prisoners. So why were security protocols neglected on the way back? There was one white, one Mexican from the northern district and two New Afrikan prisoners among a total of 25 prisoners on the bus. The remainder were Mexican prisoners from the Los Angeles County area. Yet there was no attempt to secure the bus. We prisoners were hopping from seat to seat. It was all good. The front row cages were not locked, which afforded us the freedom to move about freely. There was a “colorful” transportation officer named Wagner, who came on the bus to give a speech, talking about nothing. I’d never seen him before in my life prior to this bus ride, but he get on the bus talking all this nonsense and he kept alluding to me by name, saying, “Ain’t that right, Crawford?” I would say nothing in response. I didn’t read too much into this initially, but after we got five hours from Pelican Bay State Prison, it was nightfall outside, and here is where, in all my 29 years of incarceration, I have never seen anything so blatantly clear. Earlier we had picked up a young 23-year-old New Afrikan from Old Folsom named Tay, who was 15 months to the house and had never been to prison in his life. Young and innocent, he would make the third New Afrikan in the bus. Now we prisoners have to realize that these types of situations will be prevalent throughout our futures because CDCr will do whatever is within its power to place us as prisoners back on a path of senseless, reckless violence in order to serve their interests. They wanted the majority to attack the non-majority when there existed a clear opportunity to do so provided by the CDCr transportation. But our 20 representatives had the ability to understand our historical contradictions and how CDCr utilizes these same realities in order to allow one group to attack another based on how they place them inside the prison theater. CDCr officials allow each race, depending on who they are out of favor with, to have total dominance over the other races, which can unfortunately lead to opportunities for attacks by the majority race. The End to All Hostilities declared last year by our representatives has basically weakened CDCr’s ability to create race, gang and internal warfare inside the prison theater to the extent that they once did. We prisoners have to be very conscious of the many traps that will be set by prison officials toward encouraging prisoners into warfare. We have to remain very vigilant inside these prison environments to protect our End to All Hostilities. After we finally got to PBSP, one of the elders, Huerta, turned to me and said, “Mutope, you see what they just tried to do?” I ‘sponded, “I sure did!” He said, “You need to put that out there.” “You know I am,” I smiled. The youngster, Tay, from Richmond, Calif., was a fish out of water. I pulled him to the back of the bus with me and an elderly New Afrikan prisoner, Dadisi, and after he was done talking with the two of us, on occasion he would lean back and go to sleep, unaware of any threat whatsoever for an innocent Level 2 prisoner who had no clue. Hopefully, when he learns more about the prison environment, he will come to appreciate the 20 representatives for their foresight to institute an End to All Hostilities. He was the only prisoner to sleep on the bus. Note: Level 4 prisoners are maximum security prisoners and Level 2 are minimum security prisoners – a world of difference between the two.